If you’ve been writing for any length of time, you’ve probably amassed a collection of old manuscripts (stories, poems, essays, and even books) that would have put The Great Library at Alexandria to shame. And chances are, some of those old manuscripts were submitted for consideration at literary agencies, literary magazines, and publishing houses—but were never published. …or those drafts buried deep within your hard drive should remain undisturbed, in case unearthing them revives a long-forgotten mummy’s curse—or at the very least, some major cringing on your part. The market has changed. A writer’s career often spans several years. Sometimes, the world just isn’t ready for a specific manuscript the moment it’s finished. But the world is always changing: People’s interests shift, trends in publishing force sales to ebb and flow. Your manuscript that was overlooked ten or twenty years ago (or even one year ago) might just grab attention today. But you won’t know unless you try! You’ve met someone. Maybe a “speed-dating” type session with a literary agent at a writing conference (like these) didn’t lead to a happily-ever-after for your current WIP (work-in-progress). 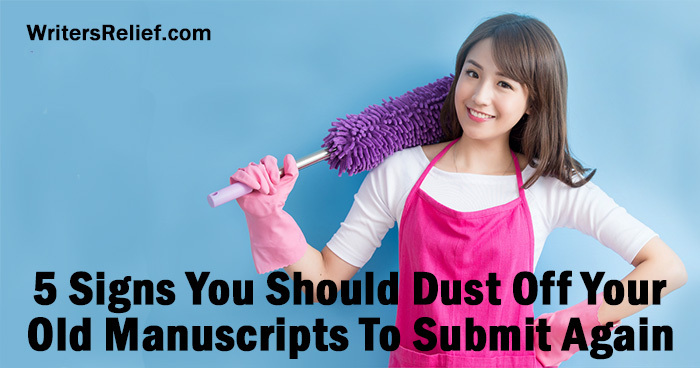 But if the agent or editor you met seemed interested in your work in general, it might be time to break out the feather duster and take a second look at your old manuscripts. Just a hunch. Don’t underestimate the importance of instinct. Though you may not be able to pinpoint exactly why you can’t stop thinking about a file you last closed five years ago, go ahead and click “open” to revisit your old friend. You might decide to totally revise, or to put out some feelers again for the manuscript as is. If your instincts are screaming at you—listen! Now you know better. Maybe, when you first submitted a particular story, poem, essay, or book, you didn’t know what you were doing. You let your enthusiasm sweep you off your feet, and your submissions went out haphazardly and with little regard for publishing industry etiquette. But now you know better. You know more. And a strategic do-over might be worth the effort. You’re kind of a big deal now. In the beginning, when your writing world was new, you might have felt as insignificant as a single-celled organism floating in a sea of primordial goo. Back then, nobody noticed you much. But it was only a matter of time. And now—look at you! All evolved and fancy, with a huge readership, a bunch of awards, and maybe even a fancy-pants MFA degree. Now that you’ve made a name for yourself, publishing pros—as well as readers—might be more interested in reading your early manuscripts. It’s just not coming together. If you’ve been working and working and working on a manuscript and it’s just not getting better, it may be time to move on. Revisiting the past stops you from trying something new. Clinging to safe, preexisting manuscripts might be a means of avoiding writing anything new. It could be time to abandon those crumbling edifices and starting building something from the ground up. You’ve grown. Chances are, your old manuscripts no longer represent who you are as a writer (technique-wise) or as a person (interests-wise). Even if a look back at old manuscripts makes you think, Wow, I was really good!—you still might want to keep them safely tucked away. After all, your current writing is the best representation of the current you. Literary agents and editors understand that market forces change, people change…the whole dang world changes. And in the Internet age, it changes fast! So editors and agents may reconsider manuscripts they’ve already seen. But if you’re going to resubmit work to agents or editors who’ve already seen it, be sure to explain why you felt a resubmission was in order. Be honest about the manuscript’s history, because many literary agents or literary magazine editors keep records of submissions. Changing the work’s title and hoping no one will notice that it’s a rerun won’t set the stage for a positive professional partnership. Question: Have you ever had any luck dusting off an old manuscript? Tell our readers how it went!